Today’s guest post is from Gerry Renert, a three-time EMMY nominated kid’s writer, who has recently become a published children’s book author. I never thought I’d end up writing children’s books, especially when my first paying writing job was creating print ads to convince upper-crusters they needed a certain brand of scotch to announce their arrival into upper-crustdom. Looking back, though, the advertising job wasn’t a curse but more a blessing in the eventual outcome of my writing career. Advertising taught me some lessons I’ll never forget. First, it taught me how to relate words to picture—either directly or, better yet, indirectly, sometimes with a fun twist of irony or an off-beat juxtaposition. Second, it taught me how to convey a message or feeling in as few words as possible. In 2009, after a stint in children’s animated TV as a writer/creator and executive producer, I decided to take a crack at writing a children’s book. A good children’s book is the perfect melding of short verbal communications that play off of or reinforce marvelous visuals. That special combination is the exact dynamic that makes for a smart, attention-getting print ad. When my first book editor told me to keep my manuscript short and simple, and let the words interact with the visuals rather than just describe them, I didn’t look at her blank faced. In fact, I looked at her much like I would look at a good advertising creative director who knew what it took to communicate something with excitement, while keeping it on-message. My first children’s book, Nathan Saves Summer, was published in 2010 and has been successful enough to warrant a second book in the series. 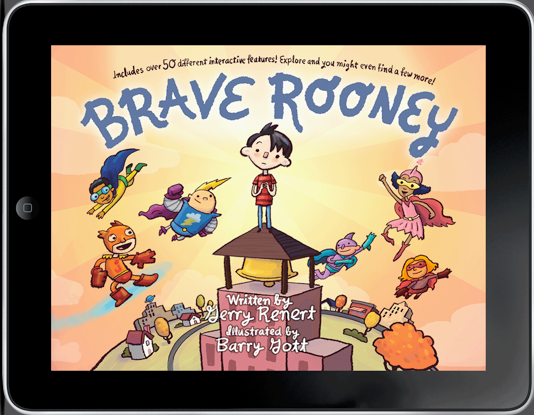 Recently I released a digital book/app, Brave Rooney, which tells the story of a normal boy who somehow finds himself in an elementary school for superhero kids. In creating the app, I worked very closely with the illustrator, just as I would have with any advertising art director, to be certain the association between words and picture had a special spark. My experience in animated TV came in handy in working with the digital developer, and I watched closely how the added elements of interactivity made the connection between the reader and the story stronger than anything one of my advertising clients could’ve imagined. Brave Rooney is the best thing I’ve ever written, and I’m pretty sure my first advertising creative director would have been proud, too. Back to the blessing/curse thing: I don’t look at writing advertising copy as either one, but as a good stepping stone that any young writer should jump on. Accept it as a truly creative form of writing and leave the scotch to the overly dramatic, tortured writers. Posted in Digital Media, Guest Post, Writing Advice. Gerry Renert is a three-time Emmy nominated TV series creator/exec producer and marketing professional with over 14 years of experience in children's television, book publishing and merchandise licensing. He has direct experience in turning unknown properties and characters into viable, international brands. Great article! I’ve never written ads, but writing poetry has helped me to keep children’s books and picture book manuscripts visual and concise. A big advantage with ad-writing, though, is being in touch with kids and what appeals to different age groups. Many of the children’s picture book manuscripts I critique seem to focus on the writer’s childhood, rather than what kids experience or want today. So, even if we don’t write ads, we can watch ads, cartoons, and programs for children to get a feel for our important audience. Thanks for the ideas. Fantastic advice. I think taking a blend of every aspect of our lives can definitely inform and help our writing.